“I’ve been in Berlin for ten years now and don’t plan on changing that anytime soon”, Alex waxes lyrical about her adopted home. 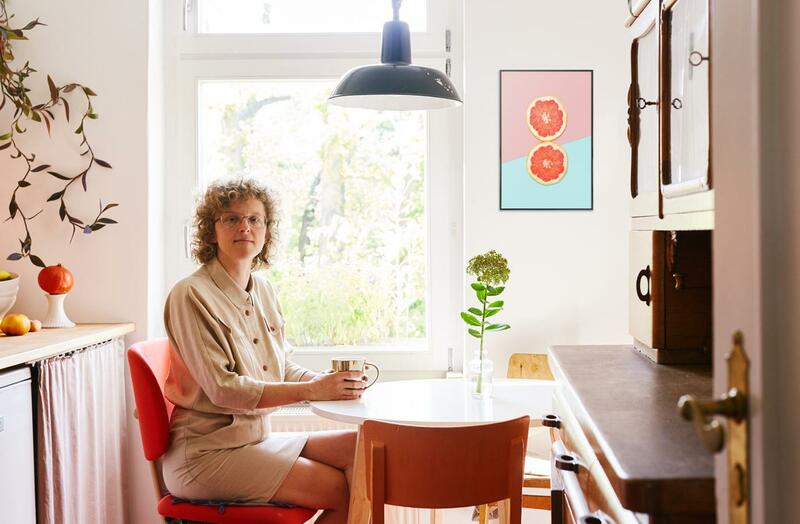 With roots in Bavaria’s Franconia region, the designer moved to the Stralau peninsula a year ago—a quiet, green oasis within the bustling Berlin borough Friedrichshain. Alex’s three-bedroom flat also serves as her place of work. In a studio flooded with light, she lovingly makes leather bags by hand for her label alexbender, surrounded by a multitude of potted plants, overlooking the river Spree. We visited Alex in her refreshingly colourful home and spoke about courageous colourways, flea market oddities, a love of order and her top 5 DIY tips. You now run your own accessories label. Tell us how you got there. I studied fashion design in Pforzheim and was already a fan of leather back then. During an internship, I then designed and sewed my first ever leather bag. I ended up in Berlin after my degree and made the leap to becoming a freelancer in 2011. Today, I design new handbags, clutches and small party bags every six months. My designs are more minimalist and timeless than trendy. I always try to counter the fast-paced fashion world with my products by creating something that lasts for years to come, not just for the current season. Where did you find all these original furniture pieces in your flat? A lot of my furniture has come to me over the years. Some pieces are from flea markets or second-hand shops, others from my Gran. Every piece has a story. Most of them are from my hometown in Franconia in northern Bavaria. I’ve customised some of the vintage pieces myself. Since living in Berlin, I’ve really caught the painting bug. A simple bit of handwork goes a long way. Sure, it involves a bit of effort, but it’s definitely worth it! I designed our bed and the bookcases myself and they were built by a friend of mine who’s a carpenter. I look at a lot of stuff on Pinterest and Instagram. There are so many great artists and designers out there. Online magazines like iGNANT also inspire me. I’m a big photography fan and have a blog with my own photos on my website. I also find the exhibitions at C/O Berlin super inspiring. We were in Antwerp recently, where there are loads of great interior shops with furniture and all sorts of beautiful bits and bobs. I find small shops with curated collections particularly interesting. You can be a bit daring when selecting wall art. 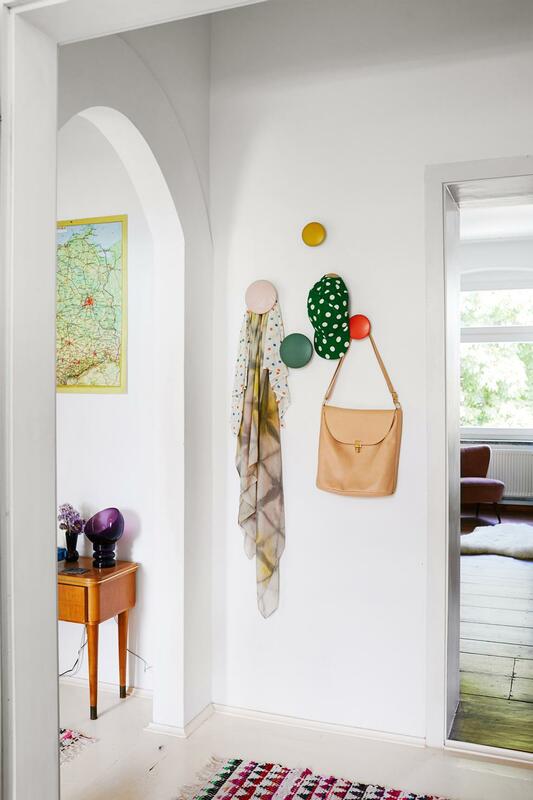 As soon as we enter the hallway, we’re greeted by a wall collage the couple pieced together from peculiar finds: clothes hangers from an abandoned swimming pool, cat plates from a flea market, a small melon bag from Greece. The living room is adorned with homemade wall hangings. These consist of leftover pieces of leather in bright colours which Alex cut into equal strips and stuck to a cardboard box with tape and then sewed on in rows. 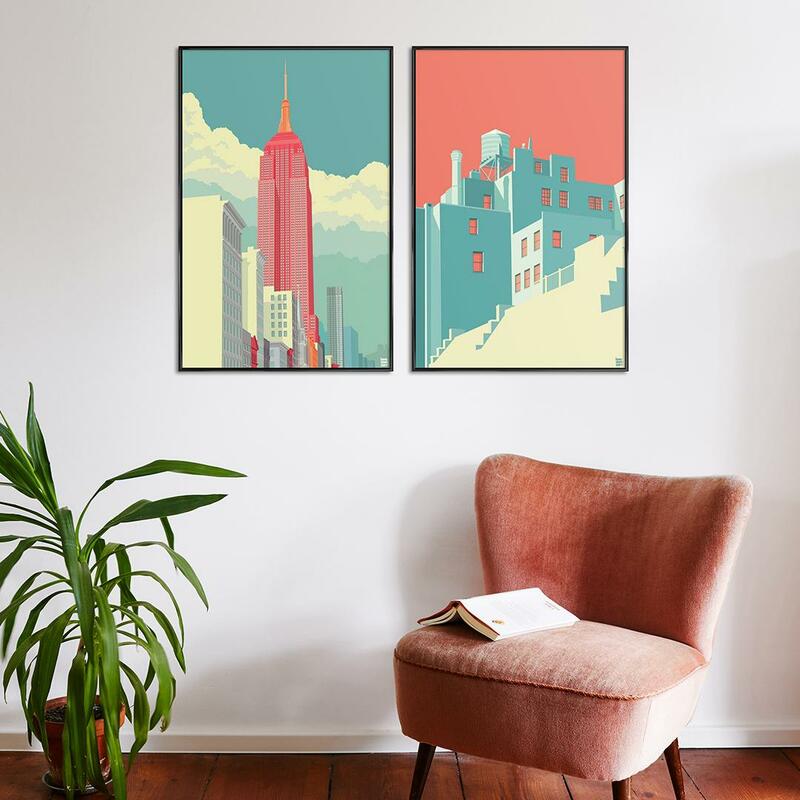 Tip from our curators: Dynamic architecture motifs such as the two New York prints by Remko Heemskerk make for an exciting contrast to the soft, pastel vintage furniture and old, wooden floors and windows. I find organising and ordering calms me. As a kid, I had a lot of fun sorting my shelves. Creative chaos? Not on your life! A passion for collecting and a love of order go hand in hand in the Bender household. From herb and spice racks in the kitchen to CDs arranged by hue to the colourful garments on the clothes rail, everything has its place. 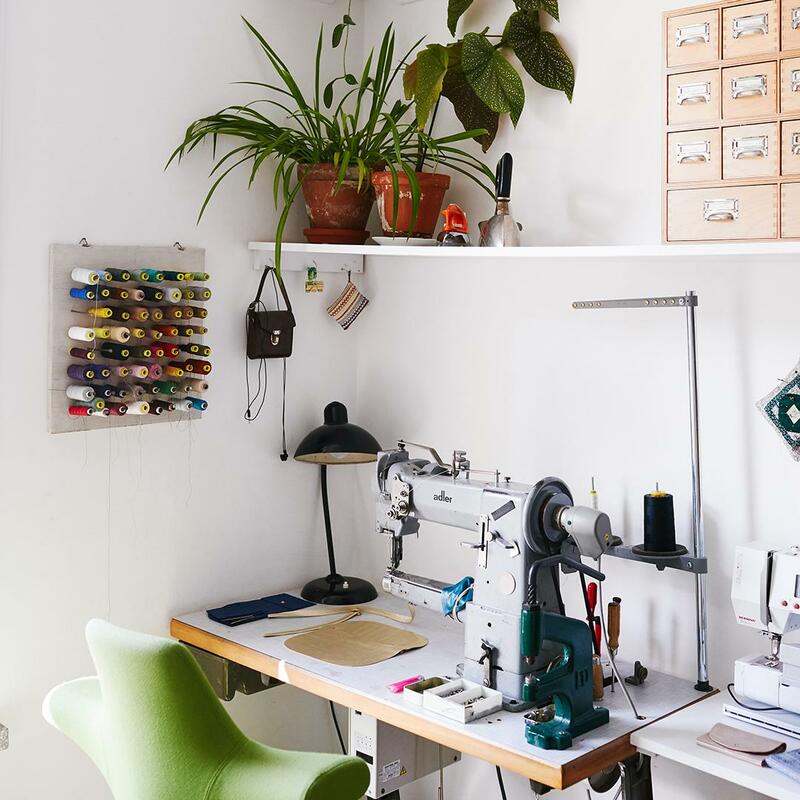 Alex’s studio is functionally set out—leather cuts and sewing tools are always within reach. Her bags are presented on a hanging rail she crafted from a log and two leather bands. The south-facing window bathes the room in warm sunlight and plants create a pleasant atmosphere. Colours are important for my well-being. I like bold and colourful combinations. But there has to be harmony. 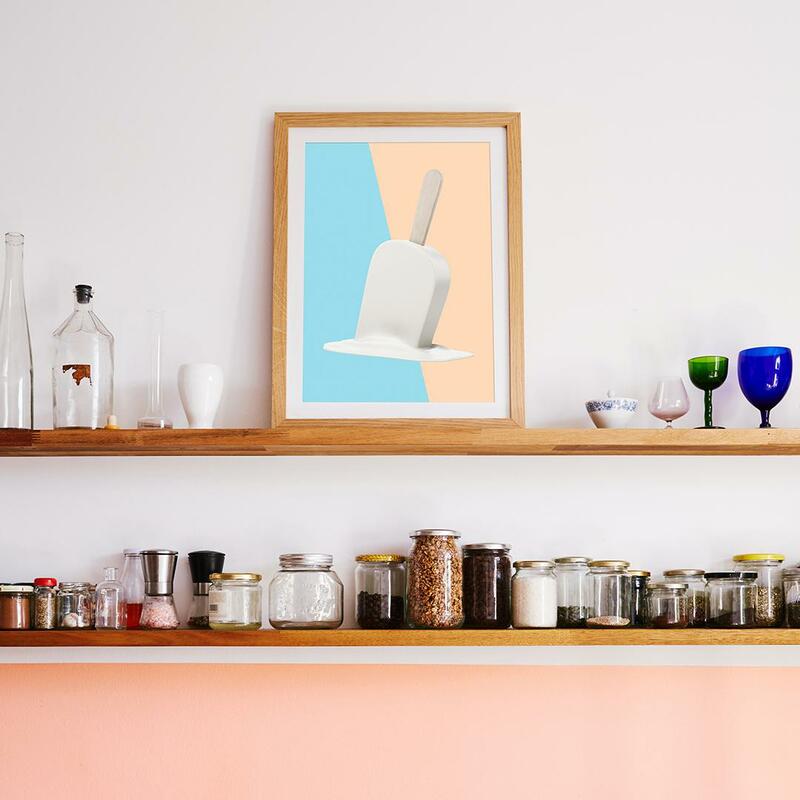 In her bright, early-1900s Altbau flat we discover piles of oddities and flea market finds, customised furniture, living accessories and wall art in deep, ice-cream colours, which our host gracefully harmonises. All new additions must match the existing colour scheme. This is based more on pastel tones than garish colours; black & white and shades of grey don’t even make it through the door. Be it wall art, cushions or pieces of furniture, the “bold and contemporary” look lives off colour accents and harmonious contrasts. To go with a red floor in her kitchen, Alex has chosen a palette of red and apricot tones, a palette which recurs through kitchen chairs, curtains and wall decorations. For Alex’s kitchen, our team of curators picked out two juicy food prints. “Breakfast for Two” makes fun of fresh fruits, while “Melting Marshmallow Popsicle” brings some summer feelings and is casually leaned against the wall. In both designs, minimalism meets rich, pastel tones: they effectively blend in to the red-pink colour scheme. I personally find a mix of new and old really exciting. You can really pep up old furniture with a bit of paint. You don’t always have to buy new furniture to change things up at home. Alex often reaches for the paintbrush and varnish to give ageing pieces a younger, more individual look. 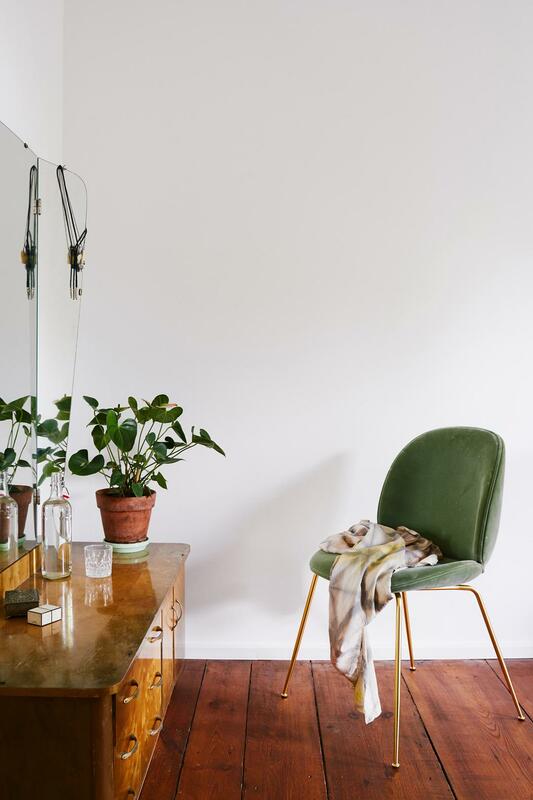 The yellow metal locker and the mint-green living room shelf are great examples of how a new colour can also transform the spatial impact of the room as a whole. Next on her list: Alex wants to give her vintage kitchen unit a fresh lick of paint. She’s already chosen a light pink tone to coat the “70s brown” colour scheme and odd stain. 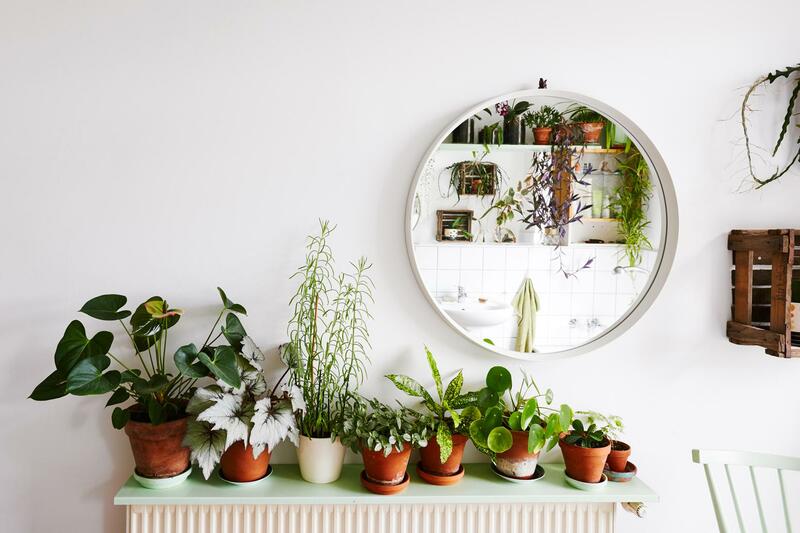 Plants are a big must—they create a pleasant atmosphere. Our whole flat has been transformed into a jungle. Alex’s flat is bustling with a total of 44 plants (and counting), which, thanks to generous doses of sunlight and a lot of love, are thriving splendidly—especially in the bathroom and study. Among her favourites are the spotted begonia (because of the beautifully spotted leaves), green lilies (very easy to look after) and the Chinese money tree (grows quickly). The designer arranges her plants in terracotta pots and macramé hanging baskets. With a pottery course on the horizon, Alex one day dreams of making her own plant pots.